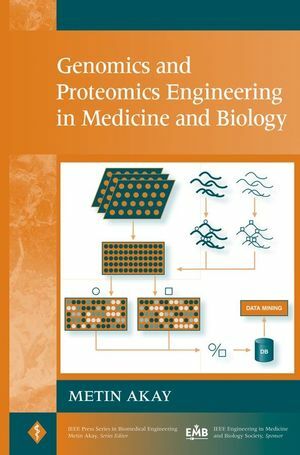 Genomics and Proteomics Engineering in Medicine and Biology presents a well-rounded, interdisciplinary discussion of a topic that is at the cutting edge of both molecular biology and bioengineering. Compiling contributions by established experts, this book highlights up-to-date applications of biomedical informatics, as well as advancements in genomics-proteomics areas. Structures and algorithms are used to analyze genomic data and develop computational solutions for pathological understanding. METIN AKAY, PHD, is the Interim Chair and Professor of Bioengineering for the Harrington Department of Bioengineering at the Arizona State University. Dr. Akay is the founding Series Editor of the IEEE Press Series on Biomedical Engineering. In 1997, he received the prestigious Early Career Achievement Award from the IEEE Engineering in Medicine and Biology Society (EMBS). He was the program chair of both the annual IEEE EMBS Conference and Summer School for 2001. Dr. Akay has published several papers in the field and authored, coauthored, or edited fourteen books. He is also the editor in chief of the Wiley Encyclopedia of Biomedical Engineering. 1. Qualitative Knowledge Models in Functional Genomics and Proteomics (Mor Peleg, Irene S. Gabashvili, and Russ B. Altman). 1.3. Modeling Approach and Results. 2. Interpreting Microarray Data and Related Applications Using Nonlinear System Identification (Michael Korenberg). 2.5. Prediction Based on Gene Expression Profiling. 2.6. Comparing Different Predictors Over the Same Data Set. 3. Gene Regulation Bioinformatics of Microarray Data (Gert Thijs, Frank De Smet, Yves Moreau, Kathleen Marchal, and Bart De Moor). 3.2. Introduction to Transcriptional Regulation. 3.3. Measuring Gene Expression Profiles. 3.5. Clustering of Gene Expression Profiles. 3.7. Searching for Common Binding Sites of Coregulated Genes. 3.8. Inclusive: Online Integrated Analysis of Microarray Data. 4. Robust Methods for Microarray Analysis (George S. Davidson, Shawn Martin, Kevin W. Boyack, Brian N. Wylie, Juanita Martinez, Anthony Aragon, Margaret Werner-Washburne, Mo´nica Mosquera-Caro, and Cheryl Willman). 4.2. Microarray Experiments and Analysis Methods. 5. In Silico Radiation Oncology: A Platform for Understanding Cancer Behavior and Optimizing Radiation Therapy Treatment (G. Stamatakos, D. Dionysiou, and N. Uzunoglu). 5.1. Philosophiae Tumoralis Principia Algorithmica: Algorithmic Principles of Simulating Cancer on Computer. 5.3. Paradigm of Four-Dimensional Simulation of Tumor Growth and Response to Radiation Therapy In Vivo. 6. Genomewide Motif Identification Using a Dictionary Model (Chiara Sabatti and Kenneth Lange). 6.3. Algorithms for Likelihood Evaluation. 6.4. Parameter Estimation via Minorization–Maximization Algorithm. 7. Error Control Codes and the Genome (Elebeoba E. May). 7.1. Error Control and Communication: A Review. 7.3. Reverse Engineering the Genetic Error Control System. 7.4. Applications of Biological Coding Theory. 8. Complex Life Science Multidatabase Queries (Zina Ben Miled, Nianhua Li, Yue He, Malika Mahoui, and Omran Bukhres). 9. Computational Analysis of Proteins (Dimitrios I. Fotiadis, Yorgos Goletsis, Christos Lampros, and Costas Papaloukas). 9.3. Sequence Motifs and Domains. 10. Computational Analysis of Interactions Between Tumor and Tumor Suppressor Proteins (E. Pirogova, M. Akay, and I. Cosic). 10.2. Methodology: Resonant Recognition Model.